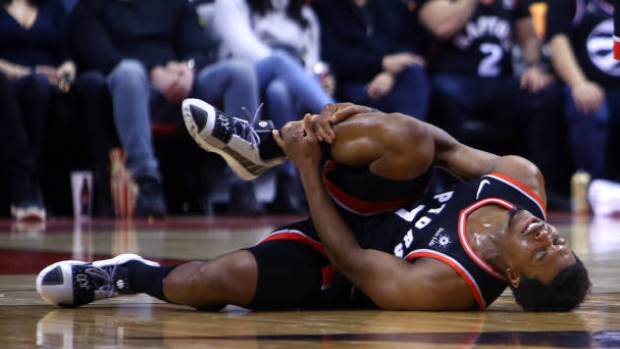 TORONTO — The Toronto Raptors say all-star guard Kyle Lowry will miss a second straight game with a sprained right ankle when the Oklahoma City Thunder visit Scotiabank Arena on Friday night. Lowry was injured in Toronto's 128-92 win over the Knicks on Monday night when New York rookie centre Mitchell Robinson fell on his ankle. Lowry, who had just returned after missing two games with a left ankle injury, had to be helped to the locker room. He then missed Toronto's 123-114 overtime victory at Oklahoma City on Wednesday. The 32-year-old Lowry will miss his 15th game this season due to back, hip and ankle injuries. He is averaging 14.8 points and 9.0 assists per game this season.